There are times you have to create installer for your client or for yourself.It is easy for end user to install application using installer.I once created a data analysis application using Picalo.You can read more about creating data analysis applications using Picalo here.I was trying to create installer of that application.I searched many options for this purpose and finally landed on Inno Setup. I noted whole process of installer creation using Inno Setup for future reference.This post provides step by step details of whole process followed by me along with screen shots.You can also download whole tutorial using the download link provided at end of this post. I am assuming that you have already downloaded and installed Inno Setup.In case you have not completed this step do so.After installing the application launch Inno Setup script wizard.I am describing each screen you have to navigate to create installer while using Inno Setup script wizard. Application Name — Name of the Application.This information is mandatory.for example Udinra.This is the name by which people will know the application.So choose the name so that it is unique and easily remembered. Application Version — Version of Application.If this installer is created for first time then version is 1 or 1.0.Now if the previous version is 2.3 then the next version is any numeric value greater than 2.3 i.e. 2.4 or 3.0 or 3.for example if previous version of udinra is 2 then current version will be value greater than 2 ie.e 3.It is mandatory information. Application Publisher — Name of application publisher.It is optional field but it is good practice to provide the information.Name of application owner either individual or company is given. Application Website — Website of application.Optional field but is good practice to provide the information. 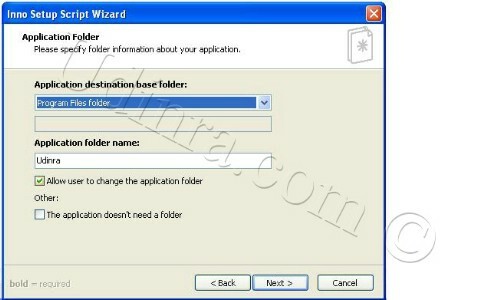 Application Destination Folder — It is the name of folder where the installed files will be located once a user installs an application using the installer created by this process.For example in above case the Program files option is chosen so if the application is installed then the installation files will be located in Program Files folder.If other folder is chosen then the files will be located there. Application folder name — It is name of the folder in which all the installed files of the application will be located.in this case the folder is Udinra.So for the above case the installed files will be located in udinra directory under the program files directory. Allow user to change application folder — If this option is chosen then the user have option to change the installation folder.If the user does not choose the folder the application is installed in the default folder i.e in udinra under program files folder. 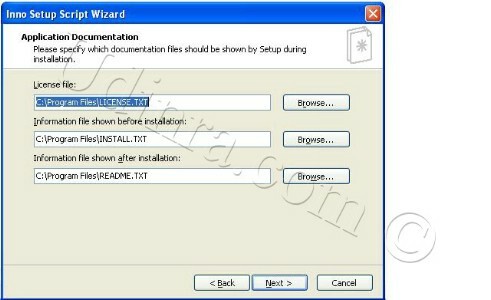 So summarizing the above facts let there is an installer udinra.exe created with above options then while installing the user can change installation location if Allow user to change application folder is checked else user cannot change the installation location and if default location is used the application will be installed in udinra sub directory of program files directory. Application main executable files — If the application contains a main executable file then click on browse and choose the main executable file of the application. Choose the option Allow user to start the application after setup has finished if application can be launched by the user as soon as installation is completed. 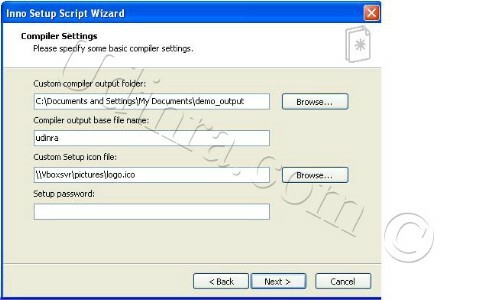 Click on the Add files and Add folders option to select the files and folder which are part of the installer for example let there is a folder a and file b,c which are to be added in the installer then these folder and files are browsed and added using this option. Custom Compiler output folder — Browse the folder under which the installer file needs to be saved so in above case the installer file is saved in demo_output folder under My documents folder. Compiler output base file name — This is the name of the installer i.e. the .exe files so in above example the name of the installer file is udinra.exe. Setup password — It is not used but if one want to protect the application using password then can specify it but remember the password entered on this screen is visible so while entering please hide it else any one standing behind can see the password. READ How facebook forces you to enter your mobile number? Application Start Menu folder name — This name appears on the START –> ALL Programs and one can see a arrow and if mouse is placed on the option the option is expanded and user can see additional options.In above case there will be an option Udinra on the Start –> All programs. Rest of the check boxes are self explanatory but it is good practice to not allow users to change Start Menu folder name.If this option is checked then user can enter folder name of their choice while installing the application in this case user can choose any name instead of Udinra. 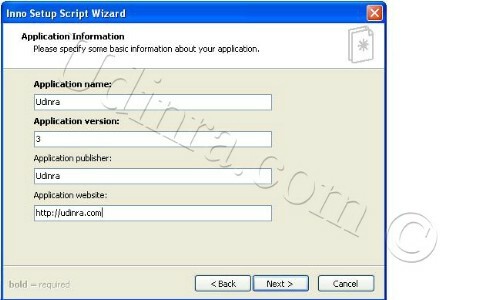 It is better to associate an application with a unique name not user defined name also from user perspective a person can forget the name assigned to the application while installing it.So don’t click on the Allow User to change the Start Menu folder name option. License file is used to display license information while installing the application,information file shown before installation can be used to display assistance and explaination of some parameters inputed by the user.This acts as great help to the user and adds to the software value.Also information file shown after installation can be used to display summary of installation. This screen is used to support additional languages during installation. Can you please give me a demo to create installer for java desktop application? If it possible to give me instructions to create installer using java jar file. Did you check out the new version? I really need help on this. The reply link is not working, so had to post like a comment. If a user has previous installed, then is there a way to prompt the user either to upgrade the application or remove the previous version first and then install the new version. Depending on user choice, I need to do the same? I have created an executable using Inno Setuo 5. The tool works absolutely fine in windows 7. But in windows, it works fine if I will disconnect network drives. Do you know how to disconnect network drives? So my application will run fine without taking network drives to the account. How to create screen to accept custom inputs and edit some files with those inputs?